KANSAS CITY, KAN. ---- From Aug. 1-10, Belfast, Northern Ireland hosted the 2013 World Police and Fire Games. The Kansas City Kan., Fire Department was represented by Firefighter and heavyweight boxer Darnell Hamilton. Over 7,000 competitors from around the world competed in fifty six sports from Archery to Wrestling. The United States led the medal board with 580 medals of which 248 were Gold. 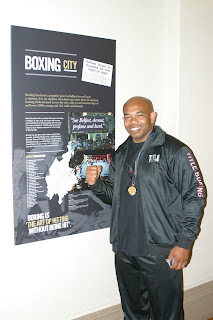 Hamilton, who had already won the gold medal in boxing two years prior in New York City, successfully defended his title and gold medal in Belfast when he defeated Canadian Andrew Pederson in a unanimous decision. Darnell was trained by fellow firefighter and boxer Marcos Ramirez, who accompanied him to Belfast. 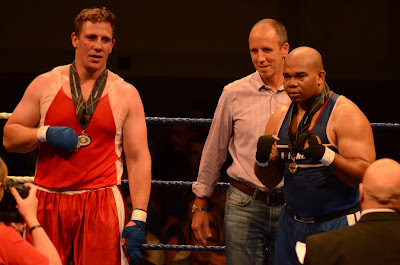 He was also assisted in his corner by Belfast, Northern Ireland Firefighter Ross McClean, who Hamilton defeated in the heavyweight finals in New York in 2011.